The tour visits key pilgrim sites in Jordan. 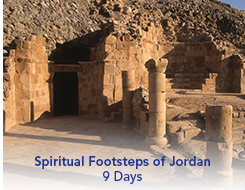 Following in the footsteps of Moses and Jesus uncovers Jordan's role in Christianity. On arrival at Amman airport you will be transferred to your hotel with the remainder of the day at leisure.